When I was at the grocery store the other day, they had a lovely display of cantaloupes. My mouth started to water at the thought of fresh slices of the orange-fleshed melon so I started sniffing through the pile to find just the right one. I am one of those people who has to sniff my cantaloupe. It smells of sunshine and summer and wonderful sweetness. When it smells “just right” I know it is the one to take home. Unfortunately, the woman standing next to me squeezing the melons like they were rolls of Charmin, kept looking at me like I was a crazy nut-job. But that is okay because when I got home and cut open my melon, it was perfection. 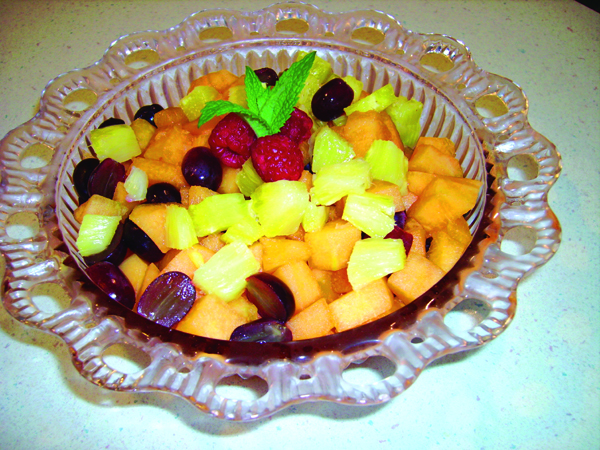 Expecting company for lunch the next day, I decided not to eat all the cantaloupe myself and instead whipped up this refreshing and simple fruit salad. After you cut the cantaloupe open, scoop out the seeds. A tablespoon will dig them out in a jiffy. Now peel and slice the melon. Cut it into bite-sized pieces. Cut your grapes in half. That's right - cut them in half. You'll have the undying love of your guests if you do. Slice up the pineapple. Fresh is best! Reserve the pineapple juice to pour over the salad. Cut open the cantaloupe, peel and then slice. I diced mine up into bite-sized pieces. After washing the grapes, I cut them in half. Yes – take the time to cut them in half. It will add less than two minutes prep time to your day and your guests will be forever thankful to you. Have you ever been sitting somewhere nice trying to show people that you weren’t born in a barn and do have a few manners trying to stab a whole grape with your fork. You stab, it moves, you stab harder, it threatens to shoot off your plate and take out someone’s eye. Never a good thing, not that it has ever happened to me. So take the time to cut those little orbs in half! Last but not least, cut your pineapple into bite-sized pieces. In a hurry (could also be interpreted as lazy) I bought pineapple spears. I do recommend going with fresh pineapple over canned because of the flavor and texture intensity. If you like whacking up a whole pineapple, go for it. If not, just buy the fresh that is pre-cut. Save the juice that will be in the bottom of the pineapple container and pour it over the fruit. Give it a good stir, cover with plastic wrap and let the flavors blend in the fridge for an hour or so. You can mak e this a day ahead. As a final step toss on a few sprigs of mint and berries. Ta-da. Wasn’t that simple and easy?